Israeli films have made a global impact. Important recent contributions include Keren Yedaya’s Or (2004); Gidi Dar’s Ushpizin (2005); Joseph Cedar’s Footnote (2011); Meni Yaesh’s God’s Neighbors (2012); Rama Burshtein’s Fill the Void (2012); and Ronit and Shlomi Elkabetz’s trilogy, To Take a Wife (2004), Seven Days (2008), and Gett (2014). All of these have met with much acclaim from overseas audiences; Footnote was nominated for an Oscar; Or and God’s Neighbors both won major awards at Cannes; and the most recent of the Elkabetz’s films was nominated for a Golden Globe. Themes range from the ultra-secular to the ultra-Orthodox, from the harrowing to the comic, from the personal to the universal—sometimes all in a single work. Israel is of course at the center of one of the most fraught political situations in history; it is difficult even to mention the literary and cinematic arts without acknowledging that political tensions and clashes often provide pivotal subject matter—as with Grossman’s moving 2008 novel To the End of the Land, and Shani Boianjiu’s 2012 The People of Forever Are Not Afraid; and in film, Yaelle Kayam’s Graduation (2008), and Ari Folman’s devastating 2008 animated feature Waltz with Bashir (another Academy Award nominee). But one recent documentary—made by U.S. filmmakers Karen Goodman and Kirk Simon (and produced by Lin Arison)—gave audiences hungry for good news about Israel something to think about. Their 2010 film Strangers No More focuses on a remarkable school in Tel Aviv called Bialik-Rogozin, where children from a wide variety of backgrounds, ethnicities, and faiths come together to learn. The film, which leaves viewers hopeful for a peaceful future for Israel and the region, in the hands of these wise and loving young people, received an Academy Award for Best Short Documentary. The film Strangers No More, is available with the purchase of The Desert and the Cities Sing: Discovering Today’s Israel. Trapped in a loveless marriage, Viviane Amsalem (Ronit Elkabetz) seeks a divorce from her devout and stubborn husband Elisha (Simon Abkarian) in Ronit and Shlomi Elkabetz’s Gett (2014). Jerusalem is a vortex. What might a newcomer expect here? Stones resounding with unfathomable history. An intimidating mix of inflexible faiths and truths. The holiest place on the planet for legions of Christians, Jews, and Muslims. A much-contested hub. Jerusalem is certainly all that. It is also a thriving city, in many ways not so different from other urban hubs: big, heterogeneous, and filled with the unexpected. Here, the ancient and the modern are in constant touch: the glow of laptops illuminates faces in cybercafés tucked under ancient archways. A boy balancing a tray of freshly baked bagels on his head winds his way through a crowd of hipster tourists. Young soldiers in uniform gaze into pastry-shop windows. In the Old City, an Orthodox man hurries down the stone steps toward the Western Wall, wrapping up a conversation on his cell phone. And artists are here, inspired by the complexity of the city’s energy. Jerusalem is a maze of cobbled alleyways, hidden courtyards, and grimy industrial zones, with countless corners where artists have set up shop. The Mamuta Art and Media Center is situated behind a low stone wall in Jerusalem’s Talbiye neighborhood, in a historic former hospital. The Center provides studio spaces for artists in various media and is a venue for exhibitions, film screenings, workshops, conferences, and a residency program for contemporary Israeli and international artists. The venerable Vision Gallery, tucked into a side street off busy Jaffa Road, is run by our friend the photographer Neil Folberg, whose stunning images grace this project. The Museum on the Seam—located, as its name suggests, on what was once the official border between East and West Jerusalem—presents innovative exhibitions that fearlessly take on sociopolitical issues. 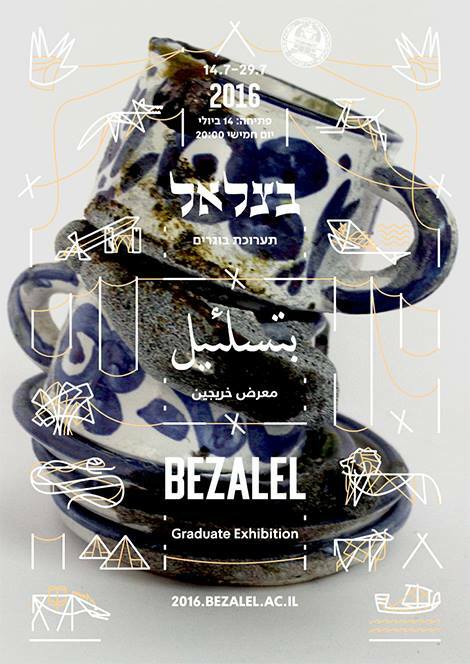 And the city is also the home of Israel’s premier art school, the Bezalel Academy of Arts and Design; its students help keep the creative vibe of Jerusalem young and vigorous. One observes in Israel a sincere respect given to creative thinking, which extends beyond the arts and into the sciences, industries, cuisine, agriculture, education, and beyond. It is a famously entrepreneurial nation, and it seems clear that this drive stems partly from the essential need to draw life from a challenging terrain, and from life to draw civilization, and from civilization to draw culture: a basic human requirement. There is a pervasive understanding in Israel that none of this is possible without creative thinking and the inspiration that art can provide. Even some of the country’s industrial parks—hugely successful manufacturing plants—strategically include art museums at their complexes. The Open Museums at the Tefen Industrial Park in the Galilee, manifest the “Tefen Model” founded by business magnate Stef Wertheimer. The central museum is as sleek and impressive as any art space in any major city. It features an art gallery, sculpture garden, industrial museum, car collection, and more—as well as educational and events departments. A museum, to me, is one factor that makes a place worthy of becoming a home. Schools, education, and security come first, of course, but a place without culture is not worth living in. A museum is a cultural need of the first order. Art, in other words, benefits both the community and the morale of employees. Over the years, Dabeet has experimented with various media, including discarded building materials (“rubbish” is his technical term for it), eventually honing a distinctive style of working with thick strands of wire, which he describes as “weaving.” The fascinating forms he renders seem to be hybrids of figuration and abstraction, the hand-wrought and the organic. For the Korin Maman Museum in Ashdod he created a extraordinary life-size sculpture of a horse for a show called Horses and Bulls. Though made of steel wires, it looks almost like a magnificent armature made of fine bentwood twigs. For Dabeet, beauty is only a beginning in art: it is “the first link,” he says. “But you must also have persuasion.” He says he believes in finding what is good and useful in even the most trying circumstances.